Karen Christenson in her classroom at St. Anthony Park Elementary School. A day-long field trip on the Mississippi River with a group of 60 sixth-graders in 2002 was a turning point for Karen Christenson. She was a classroom teacher at World Cultures Magnet School in St. Paul and was tasked that year with educating a particularly challenging group of children. She and her students—many of whom had significant behavior problems—were on the Big River Journey, a program of the U.S. National Park Service, which takes students on riverboat excursions down the Mississippi while learning from field experts about the river’s geology, ecosystems, aquatic life and more. Christenson began using a more hands-on approach to teaching and bringing the outdoors into her classroom (and her classroom into the outdoors). And she switched her teaching focus to science. “I came to realize this is the way education can be: real, engaging, interesting, fun, hands-on inquiry,” she said. 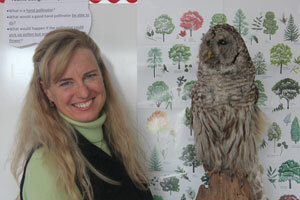 In March, Christenson—a science teacher at St. Anthony Park Elementary School—was named an Outstanding Educator by Project Learning Tree, the national environmental education program of the American Forest Foundation. Christenson will be honored at a conference in Traverse City, Mich., in May. She will also attend the World Forestry Center’s International Educators’ Institute, in Portland, Ore., in July. She is the fifth Minnesota teacher to win the award since it began in 1994. Yet the outdoors had a big influence on her in her youth. The youngest of six children in a “boisterous” family, she found quiet in the branches of the willow trees in her backyard, she said, where she watched the birds and had what she calls “dreamy time.” She continues to find restoration in the outdoors and says that’s what today’s children need too. “They are so very scheduled and busy, and that needs to be balanced,” she said. This is Christenson’s second year at St. Anthony Park as a half-time teacher, working alongside the school’s longtime science teacher Jim Schrankler—who Christenson credits with building a stellar science program at the school. Eighty-seven percent of the students at the school have reached or exceeded proficiency in science, according to the Minnesota Comprehensive Assessments, and that’s largely due to Schrankler’s “outstanding work with students,” Christenson said. “He’s an awesome science teacher and a wonderful human being,” she said. Christenson teaches kindergarten and first grade and works with Schrankler in the after-school extended learning program. Using the Project Learning Tree curriculum in her classroom, Christenson’s teaching includes “schoolyard safaris”—hands-on lessons and outdoor exploration. At the end of each unit of material, she asks her students what was good, bad and interesting. “Most of the time the good is the time they spent outdoors—the time we looked at bugs, the time we looked through magnifying glasses, the time we worked together to measure a tree trunk,” she said. The school is now working to extend outdoor learning across curriculums. Collaborating with St. Paul Parks and Recreation and the school district, Christenson has initiated the Department of Natural Resource’s (DNR) Minnesota School Forest Program at the school. The plan is to designate an area of green space at Langford Park and the edge of the school’s playground as an outdoor learning lab. More than 100 schools in the state have a designated school forest. Once established, the DNR works with schools to develop curriculum and educational materials. The School Forest Program recommends a committee of six to 10 teachers to establish the program at a school. Sixteen St. Anthony Park teachers signed up to help. Christenson, a graduate of the University of Wisconsin-Madison, taught in Japan before joining St. Paul Public Schools in 1989. She taught at J.J. Hill, Capitol Hill, World Cultures and Bruce Vento before moving up to Grand Rapids, Minn., where she helped launch the Junior Naturalist Program in six schools. She returned to St. Paul schools two years ago. Christenson trains teachers across the state in using their school forest as an outdoor classroom. She is also a lead instructor for summer academies that show preK-12 educators how to integrate forestry education into their curriculum.